London firm Timothy Hatton Architects has added a burnished steel staircase to rug designer Deirdre Dyson's Chelsea carpet gallery as part of a renovation of her studio. 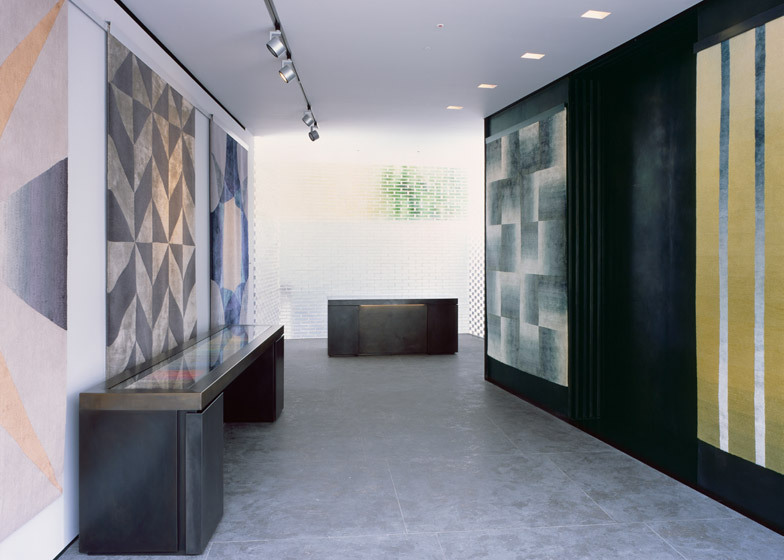 Deirdre Dyson had previously used the building as a studio and showroom, but decided to overhaul the space to incorporate a gallery that could also display rugs as works of art. "Our intention was to create an architecture for the gallery that is intriguing, enticing and inviting, while at the same time delivering spaces that allow calm contemplation of the works of art on display," said studio founder Timothy Hatton. The basement of the building has been converted into an office space and design studio, and a roof terrace added to the top floor. The rest of the building has been transformed into a gallery, with rugs displayed hanging on metal frameworks. Connecting all four floors is a floating steel staircase, attached to a four-storey-high wall of patinated, burnished metal. The spaces between each step allows light to filter down from the roof terrace, with the staircase also visible from the front windows of the building, which is situated on the King's Road. New York metalworker William Nitzberg created the staircase as well as the framework that hangs the rugs – both of which were designed by Hatton. The architect also created bespoke metal furniture for the gallery, including a meeting table, sample benches that show the various wool colours, and work desks for the office. "Tim Hatton was very clear about what he wanted to create and pushed us to use our skills to meet his vision," Nitzberg said. "It goes without saying that a four-storey steel edifice with tread appendages with integral gallery panels is a challenge." Lighting for the gallery was provided by Lighting Design International, who treated the building as an art gallery rather than a carpet showroom. Spotlights were installed over the hanging rugs to emphasise the colours of the dyes used in each carpet. Floors are made of silver Catalonian limestone, and walls and ceilings are also painted light grey. The colours are echoed in the slightly darker grey brick exterior of the building. The architects added glass bricks to the back wall of the gallery, to bring additional natural light into the space. Metal railings on each floor allow visitors to peer over at the room below, and out of the front windows of the building. "We have created something very special out of what was an ordinary shop," said Dyson, who is married to British inventor James Dyson. "I now have a first class gallery that is designed to connect our visitors with the artworks and indeed with the space itself." Floating staircases are commonly used to create a focal feature inside a minimal space, and also appear in London studio Haptic's renovation of an Oslo loft and Portuguese firm A+R Arquitectos' refurbished house. Photography is by Tom Hatton, unless otherwise stated.